deletes the contacts from the list you selected. If an element is greyed out, it means that you need to set its properties. Clicking an element opens its Properties. The Subscribed via condition is preset for any list and any method. We recommend you modify the settings to better suit your needs. Under the Properties tab for the element, use the drop-downs to narrow it down by list and method. For the Stage filter, use the drop-downs to select by which stage or stages in a specific pipeline to filter the deals. 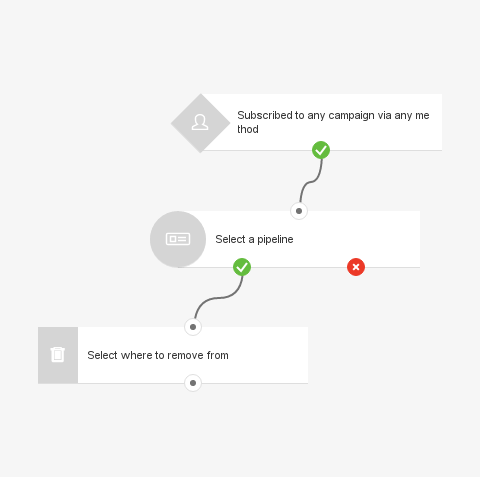 For the Remove contact action, select the option to remove contacts from a list and then select the list you used in the Subscribed via condition.